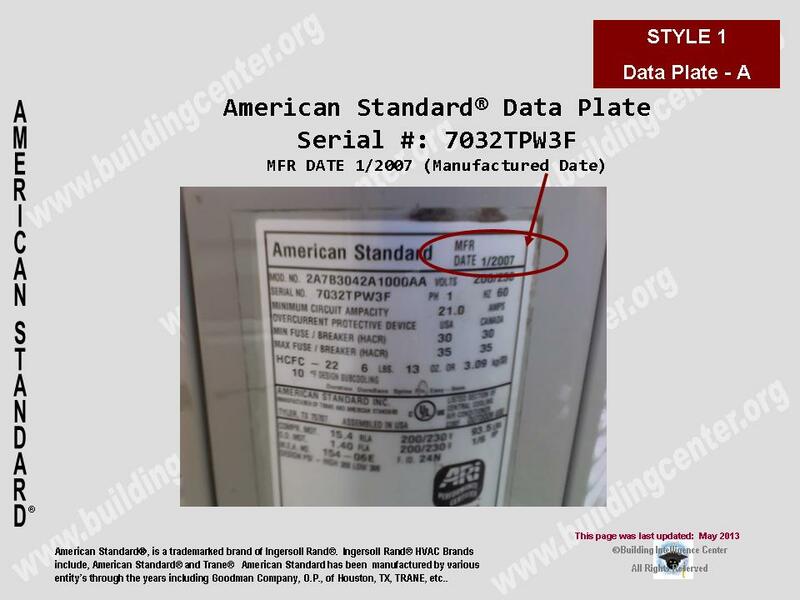 How to determine the date of production/manufacture or age of American Standard® HVAC Systems. 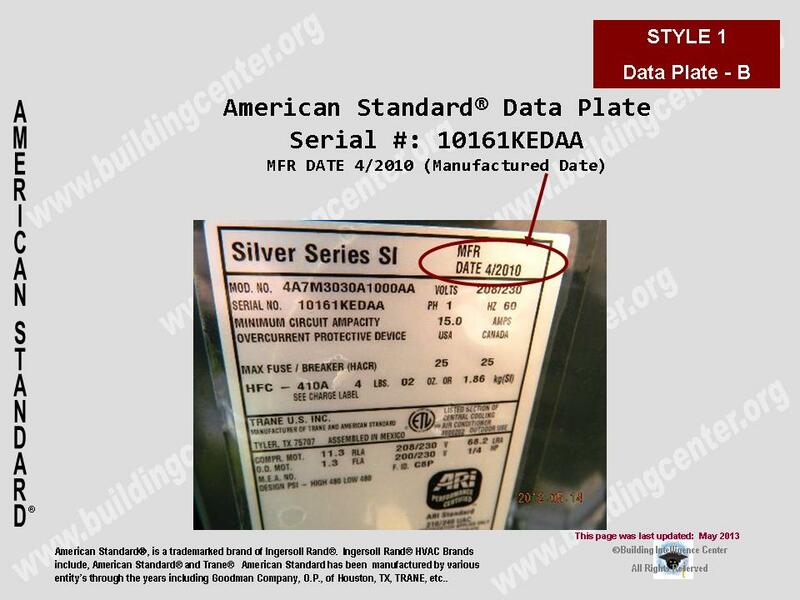 The date of production/manufacture or age of American Standard® HVAC equipment can be determined from the serial number located on the data plate. Year of manufacture – The first numerical digit of the serial number. 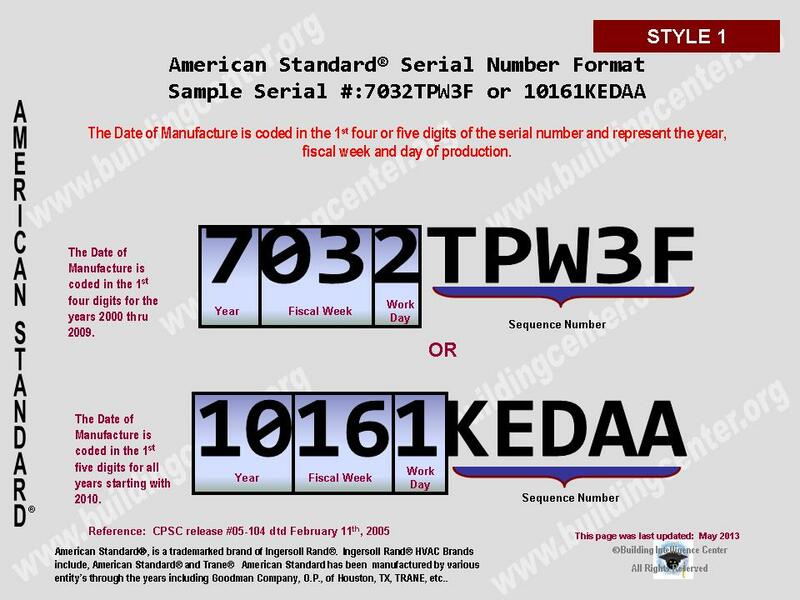 Week of manufacture – The 2nd & 3rd numerical digits of the serial number. Work Day of the week of manufacture – The 4th numerical digit of the serial number. 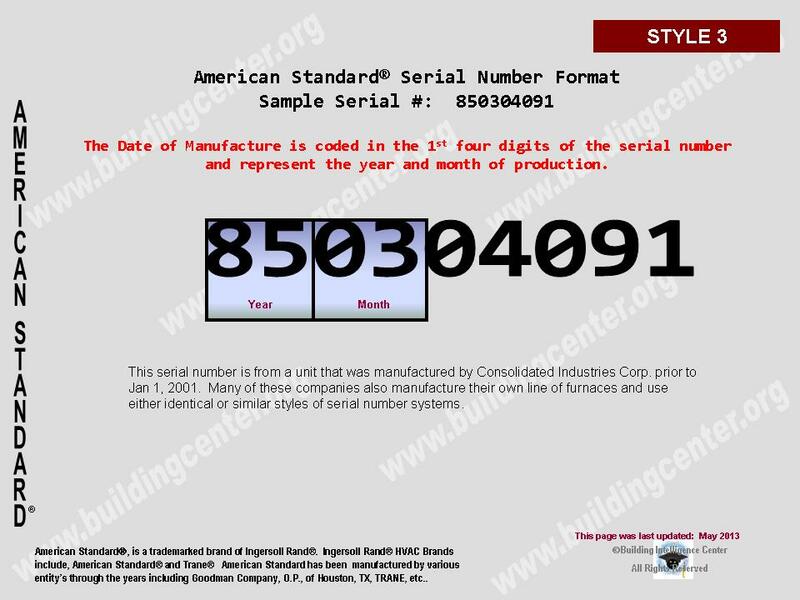 Year of manufacture – The 1st & 2nd numerical digits of the serial number. 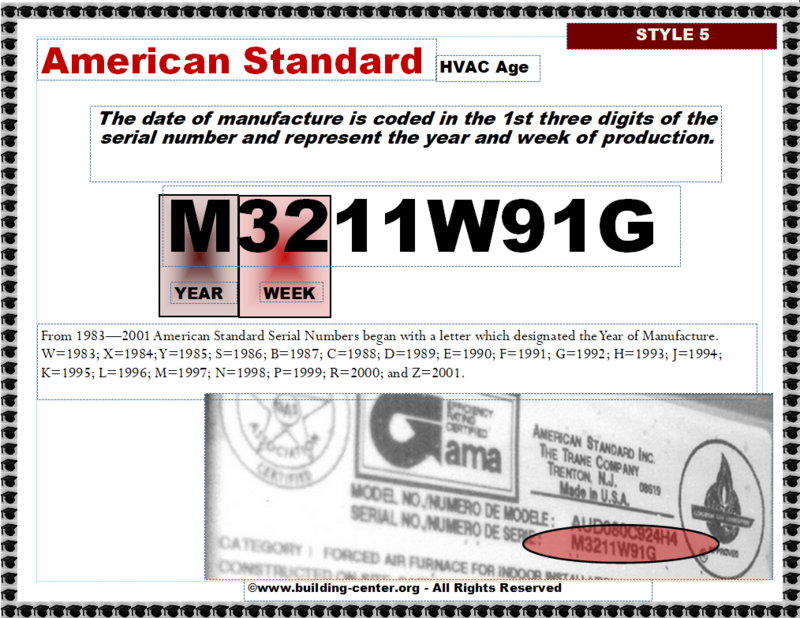 Week of manufacture – The 3rd & 4th numerical digits of the serial number. Work Day of the week of manufacture – 5th numerical digit. Description: Nine (9) character Serial number (includes dash) begins with a single letter character followed by two (2) numerical digits a (-) dash and ends with five (5) numerical digits. Month of manufacture is 1st letter digit of the serial number. (See chart below). 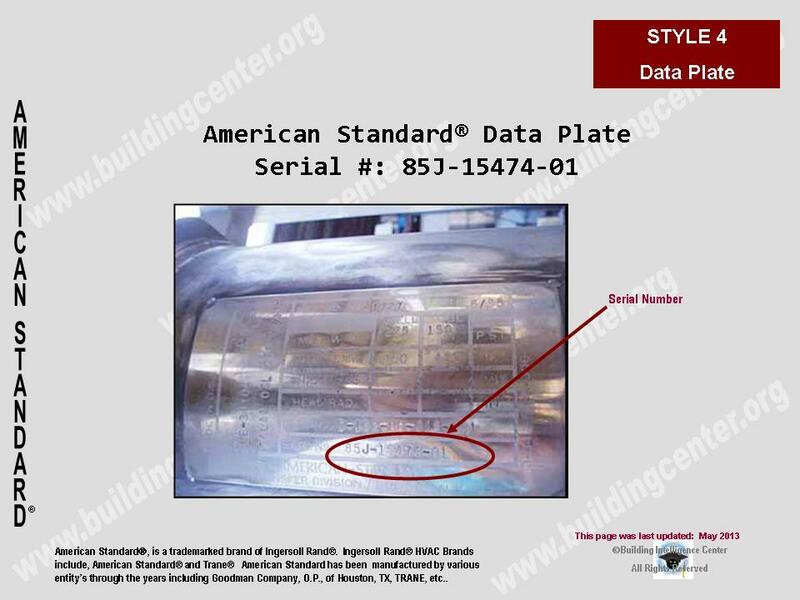 Year of manufacture is the 2nd and 3rd numerical digits of the serial number. 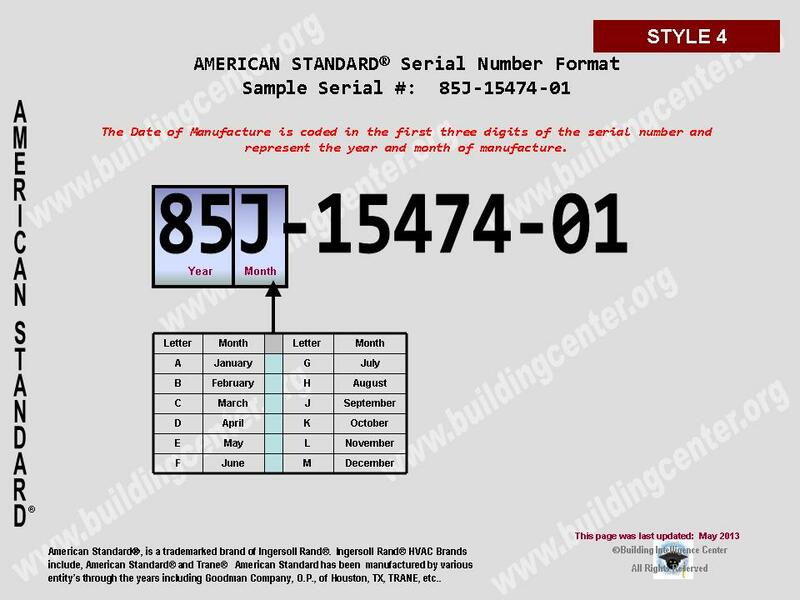 Description: Nine (9) digit all numerical serial number. Year of manufacture is 1st – 2nd numerical digits. Month of manufacture is 3rd – 4th numerical digits. Description: Twelve (12) digit (includes dashes) serial number that begins with two (2) numerical digits followed by one (1) letter digit a dash (-), five (5) numerical digits, another dash (-) and ends with two (2) numerical digits. Month of manufacture is 3rd letter digit. (See chart below). 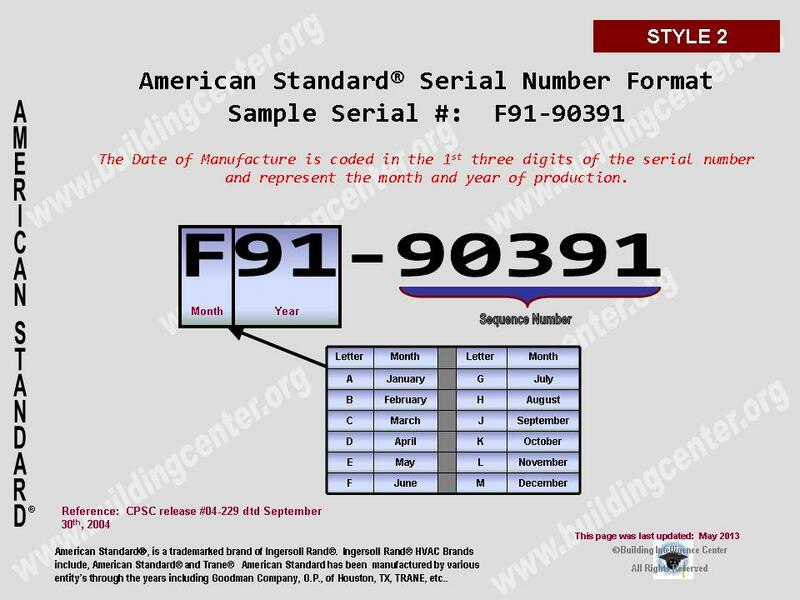 Description: Ten (10) digit (includes dashes) serial number that begins with one (1) letter digit followed by two (2) numerical digits and a dash (-), and ends with six (6) varied letter and numerical digits. Year of manufacture is 1st letter digit. Week of manufacture is 2nd & 3rd numerical digits combined.